Junk-food-laden diets, lack of exercise, desk-bound jobs, people opting to play video games where they pretend to play a sport instead of actually playing the sport—all of these factors are contributing to our worldwide epidemic of weight gain. A multi-million-dollar industry has sprung up in response to this epidemic, but many of their “solutions”—including diet centers, books, CDs, DVDs, special foods and beverages, pills, and even medical procedures like lap band surgery and liposuction—are often either ineffective, or at best temporary. Specific factors that can contribute to weight gain include many ingredients and chemicals in our modern diet, including meat laden with hormones and antibiotics, rendered animal fat, saturated fat, trans fat, chemical preservatives and additives, and manmade sugars and sugar substitutes. Taking the Cleanse, with its herbal formulas, healthy diet regimen, and necessary self-care activities, can help you make a commitment to your healthy, sensible weight loss process by providing you with a vital and palpable first step. The helpful information contained in the included booklet, on our Dherbs.com website, and from our helpful consultants should be particularly effective in helping you to avoid common pitfalls that can stem from traditional weight-loss methods—pitfalls that can include cravings, lack of willpower, losing and regaining the same ten or so pounds over and over again, and abandoning healthy new habits once the goal weight is achieved, which usually results in regaining the entirety of the lost weight, and sometimes more. The bottom line is that you felt like you were at a crossroads, and you made the first step toward health and well-being by ordering this Cleanse kit. From here on in, we’ve got your back. Lean on us and we’ll help you with support and information. Weight loss is when you lose weight which causes the subconscious mind to go find the “lost” weight because by nature you can’t lose anything that belongs to you. People do not say they lost "unnecessary" weight or "unhealthy" weight, they just outright say they lost weight and this is what sabotages them. Weight release means you "released" the weight, the unnecessary and unhealthy weight of course. It has an energy of self control, it implies your conscious intent to "release" whereas ‘lost’ implies the opposite. People who lose weight gain it back far more than people who use the right language and say they released weight. WHAT DOES THE WEIGHT RELEASE CLEANSE CONSIST OF? DIRECTIONS: Open inhaler, close your eyes and mouth, and inhale gently and deeply. Contains essential oils used as an additive to your bath water, intended to help aid your body in cleansing excess and waste and assist in regulating the appetite through aromatherapy. DIRECTIONS: Add 5 to 8 drops to your bath water and swirl with your hand to mix. WHAT IS THE DIFFERENCE BETWEEN THE FULL BODY CLEANSE AND THE WEIGHT RELEASE CLEANSE? The Weight Release Cleanse is designed to help those individuals who have difficulty releasing weight (waste) on the Full Body Detox due to non-toxic problems, i.e. impaired endocrine functions, emotional issues, subconscious programming ("holding on" to weights of the world or life), and mental sabotage (concentrating on not wanting to be fat and so thereby attracting fat in accordance pursuant to the Law of Attraction and the science of NLP: Neuro-Linguistic Programming). †Weight release is achieved through a combination of diet change and routine exercise. I'm allergic to all berries, pineapple, tomatoes, and some tropical fruit. I notice that on your cleanses there are berries, are there any cleanses that do not use berries, or can you make suggestions for me. Thank you. Which is the best cleanse to help with weight loss and bloating? We suggest doing the Full Body Cleanse. The Colon & Digestive Tract Formula that's in the Cleanse helps address bloating and waste that contributes to weight issues. Greetings, What's the expiration on herb capsules? Herbs don't expire but they do lose potency over time. We wouldn't recommend consuming the herbs after 3 years. Trying to decide which product is better for me. I want to lose weight but also want a healthy body. Is the weight release cleanse & regimen better than the Full Body cleanse? Both cleanses help with weight loss. The Full Body Cleanse detoxes the entire body of the things that contribute to weight issues, getting your overall health into a better state first and foremost; which is why it's recommended to do first. The Weight Release Cleanse helps to regulate your metabolism, hormones and food cravings to help with weight loss. It's just two different approaches to help with losing weight. Weight Loss on the Full Body Cleanse is just one of the benefits in detoxing. Unfortunately we only have regimens for 10 days and 20 days. It takes 20 days for your body to learn a new habit which is why cleansing and detoxing is a different approach to weight loss. Once you have completed the full body cleasnes and weight release cleasnes, how often do have to continue too take these products? You can cleanse as often as you like or as often as it's needed. It's not necessary to continue taking the products, the decision is yours to make. We would only recommend continuing with products based what you're trying to achieve in good health. I want to cleanse my whole body and lose 40lbs.Can this be done with the full body clense or the weight loss cleanse? Both cleanses help with weight loss. The Full Body Cleanse detoxes the entire body of the things that contribute to weight issues, getting your overall health into a better state first and foremost; which is why it's recommended to do first. The Weight Release Cleanse helps to regulate your metabolism, hormones and food cravings to help with weight loss. It's just two different approaches to losing weight. Weight Loss on the Full Body Cleanse is just one of the benefits in detoxing. Which Cleanse should I do first, The Weight Release Cleanse or Full Body Cleanse? What is the recommended route? Is the inhaler and bath drops needed? How much do they contribute to weight release? Both cleanses help with weight loss. The Full Body Cleanse detoxes the entire body of the things that contribute to weight issues, getting your overall health into a better state first and foremost; which is why it's recommended to do first. The Weight Release Cleanse helps to regulate your metabolism, hormones and food cravings to help with weight loss. It's just two different approaches to losing weight. Weight Loss on the Full Body Cleanse is just one of the benefits in detoxing. The inhaler and bath drops in the Weight Release Cleanse are aromatherapy approaches to help curve your appetite, helping to address the mental obstacles that contributes to weight issues. For many, weight issues stem from eating habits that can be from addictions. Including a mental approach helps people mentally control their appetites. Why is sexual activity not recommended on the weight release cleanse? We don't recommend engaging in sexual activity because you're detoxing your body of toxins, you want to avoid exchanging bodily fluids with your partner. Whats is its cost in indian currency? Is the Tea, bath drops, and inhaler included in the weight release cleanse and regimen? or do you have to buy those separately? 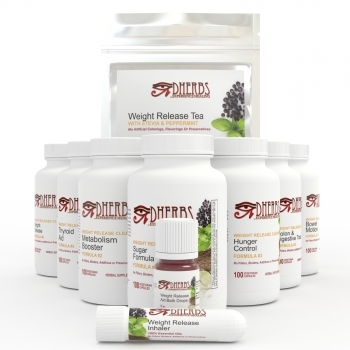 Yes, the Weight Release Cleanse and Regimen includes the tea, bath drops and inhaler along with the supplements. Congratulations on your success with the cleanse. The capsules are always more potent then consuming the tea's. You can always leave a review on your last purchase and get a 15% discount towards a new purchase. If you want to continue with loosing weight we suggest taking the Weight Release Formula and the Colon Formula. You can also add the Thyroid Aid as it is common that weight loss issues stem from imbalanced hormones, which is why the formula is included in the Weight Release Cleanse. Do you think it better to to start with the full body cleanse first or the weight release cleanse & Regimen? We always recommend doing the Full Body Cleanse first. The cleanse detoxes all of your major organs helping to clear your eliminative channels. In doing the cleanse, you're eliminating the toxins and waste from your body that often contributes to weight issues. The weight release cleanse is geared towards those who has done the full body cleanse looking to loose additional weight. I have three days left of the 20 day Full Body Cleanse and I'm interested in the Weight Release Cleanse & Regimen. Is the eating plan the same as the Full Body Cleans and what are the pills regiment/schedule? Yes, all of the cleanses require you to keep a raw food diet. The Weight Release Cleanse includes 7 formula's that are taken daily. The schedule is similar in which you're consuming the supplements every 2-3 hours. I am taking thyroid and cholesterol meds, is this product safe to use? Yes, it's still safe for you to do the Weight Release Cleanse & Regimen. For better results we suggest doing the Full Body Cleanse first. The Full Body cleanse is a detox program that eliminates heavy metal toxins and waste from your body that often contributes to things like weight issues and certain health ailments. In doing the cleanse, you're detoxing all of your major organs boosting your energy levels and immune system. We suggest doing the Full Body Cleanse first to help nourish your thyroid and help bring your cholesterol down. This cleanse can also help your body release unnecessary weight. The cleanse is still safe to do as a person who takes medication. We don't recommend taking medication while on the cleanse, but the decision is yours to make. The cleanse includes activated charcoal, a major part of the detox program, that helps pull out heavy metal toxins and drugs from your body. Most medications are recognized by the body as chemicals and pulls it from your system. If you do decide to take the medication while on the cleanse, please contact us directly at 866 434 3727.